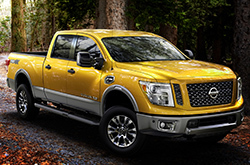 Bold strength meets every day practicality in the all-new 2016 Nissan Titan in Phoenix. Praised by 2016 Nissan Titan reviews for its ability to combine heavy-duty hauling with light-duty comfort and affordability, this top-notch pickup is a superlative option that you'll love to bring on the worksite, downtown or around uneven terrains in Northern Arizona. The new Titan has plenty of options that make for a personalized experience. From two frame sizes and three cab configurations to five trim levels and three bed lengths, the revised Titan offers a little bit of something for everyone. Plus, the available all-wheel drive, extra bed options and exceptional towing aids make the Titan a customizable giant fit for any adventure. For truck lovers looking for power, our 2016 Nissan Titan review recommends the incredibly capable, all-new XD model. Powered by a Cummins twin-turbo-diesel 5.0L V-8, the Titan flaunts hefty performance rated at 310 horsepower and 555 lb-ft of torque. This performance is especially highlighted when the XD carries up to 2,000 pounds in its payload and trailers up to 12,000 pounds when properly equipped. Perfect for transferring materials between job sites or camping trips on the weekend, the Titan XD offers top-notch handling, phenomenal strength and extra efficiency thanks to the diesel engine, heavy-duty six speed transmission and battle-tested chassis. While the XD is a heavy duty option meant for utility, the standard Titan remains a valiant choice for drivers looking for a half-ton pickup to keep up with their active Phoenix lifestyle. New this year, the Titan will be available with a six-cylinder engine on top of the already-existing gas V8. With interior features like automatic dual zone climate control, a 12-speaker premium audio system, NissanConnect with Navigation and available Zero Gravity front and rear seats, the Titan offers pristine comfort. But, take one look at the bold grille, aerodynamic silhouette, front spoiler and sleek dimensions and you know this truck is ready to take on any task ahead. Test drive the 2016 Nissan Titan in Peoria to experience this mega performer that stands alone as a combination of excessive strength and contemporary affordability. 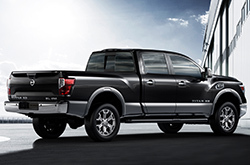 Available as a standard half-ton or the stronger XD, the Titan is a choice you won't regret making. The 2016 Ford F-150, Dodge Ram 1500 and the Chevy Silverado are outperformed by the 2016 Titan in quite a few areas. 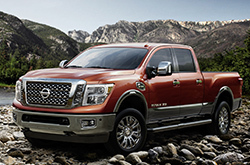 The Titan's attractive styling, modern cabin amenities and inexpensive MSRP are sure to win over AZ shoppers. You'll clearly see that when compared to the competition it's a fantastic value in regard to price, which is why many Peoria Nissan customers choose it. Look over the Titan bullet list under this paragraph for more quick facts. If you have further questions about the 2016 Nissan Titan after reading our review, please contact Peoria Nissan for answers. We stand out from other dealers by offering reviews offered to assist you in your vehicle search. Everything perspective car buyers need to make intelligent decisions is right here, including info regarding fuel economy and other specs. Each section is stuffed with invaluable data and specs - all at your fingertips. Thank you for reading Peoria Nissan's 2016 Titan review. Now that you know more about the Titan, call us to learn about finance offers and deals from the OEM that can help you save a significant amount on your purchase.